This Joseki is rather rare, as it is primarily played only with the SanRenSei opening . It was developed by Takemiya Masaki and its primary aim is to develop powerful Thickness towards the center. At first glance this move looks slow and cumbersome and doesn't appear to apply much pressure on White. It was these properties that first led me to take a look at this move in more detail. After all Shusaku's Kosumi has been considered to be too steady for modern play. Yet Takemiya's kosumi is a modern invention, so it must have taken into account recent lines of play? There are several ways of continuing from here. A common response is for White to jump into the corner with a. As the kosumi does not apply as much pressure to White as something like a pincer, White will often play tenuki. The most common one is the other approach at b. Occasionally White will want to counter Black's influence with something like the keima of c.
The move was played several times by Takemiya in 1982; after that it was used with low frequency both by himself and by others. It gained some popularity in the period 1996-2000, but seems to be getting rare once more since. 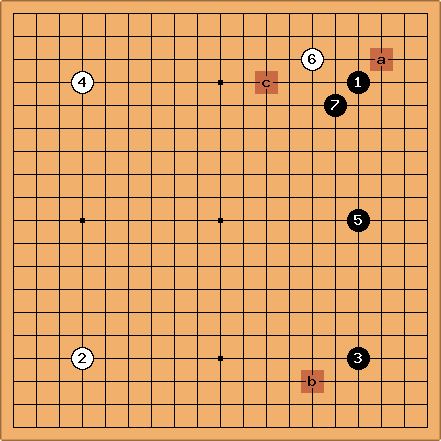 Takemiya's Kosumi Corner Invasion - Look here for continuations from a.
Takemiya's Kosumi Tenuki - Look here for continuations after White does not respond to the kosumi locally. Takemiya's Double Kosumi - Look here for continuations arising from playing kosumi in response to the second approach at b.
Takemiya's Kosumi Knight's move - White c is another possible response. 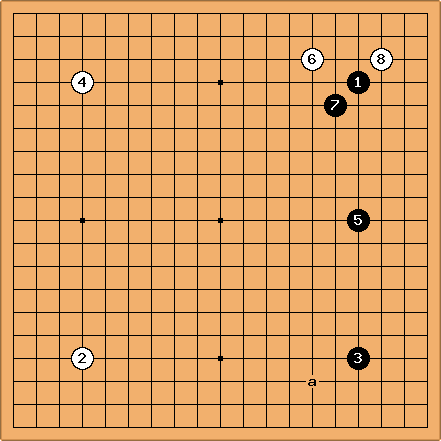 It seems to have been played first by Handa Hayami in 1940, as an isolated innovation. As such it is even older, as showed by the following game from 1934. 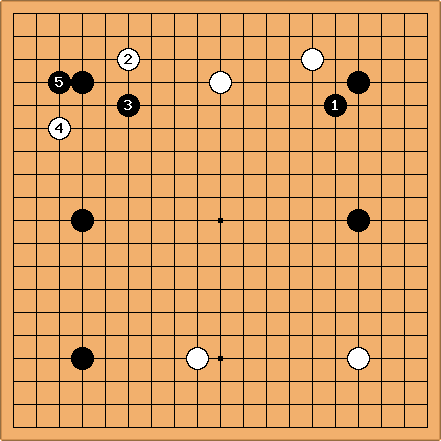 Sakata Eio 1 dan (Black, two stones) is playing Go Seigen 5 dan. Then again, what move has not been tried in the shinfuseki era? In such cases it seemed an effective weapon. It was not until later that Takemiya began to regularly use it in the standard SanRenSei. In the SanRenSei the move has proved significantly less effective. Although Cho played in this first encounter, he switched to the alternative play at a the following month in game 4. This quickly became the standard and has given White a very high winning ratio in this line. It is not hard to imagine that the influence of the extra hoshi stone on the lower side in the YonRenSei is sufficient compensation for the essential slowness of the kosumi. 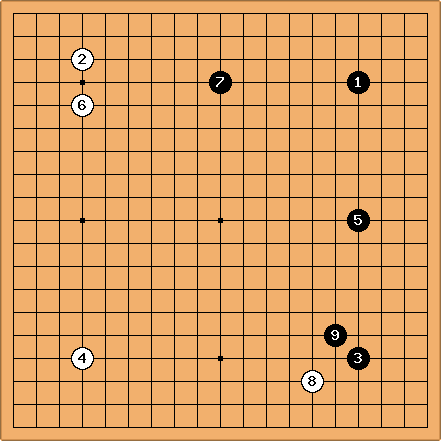 When it is missing in the regular SanRenSei, the immediate play at a leaves Black overconcentrated with only the one position on the right side of the board.